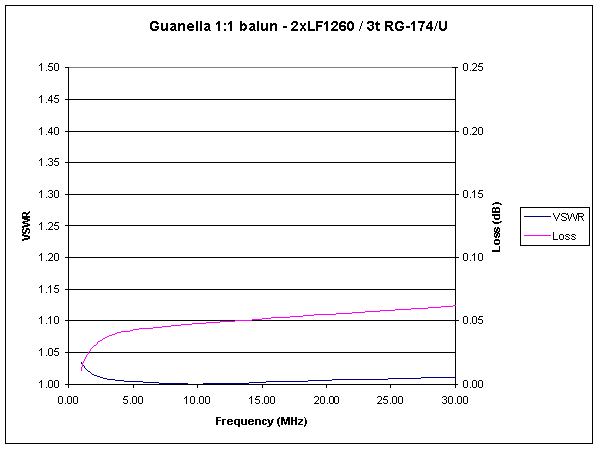 This article applies the lossy transmission line model described at A model of a practical Guanella 1:1 balun to such a balun made from a pair of Jaycar LF1260 cores side by side with three turns of RG-174/U coaxial cable. The LF1260 cores are readily available in Australia, and at the time of writing retailed for A$4.50 for a pack of 6 cores. Fig 1 shows the common mode choke impedance for calculated from measured core characteristics. Quantity Zcm is the magnitude of Rcm+jXcm. 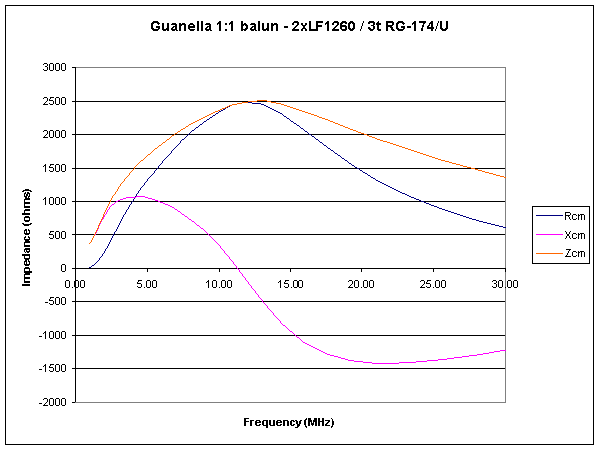 The model includes 4.5pF of shunt capacitance to calibrate the model to a measured balun. 1.02 07/03/2008 Revised to 3t with stray capacitance.